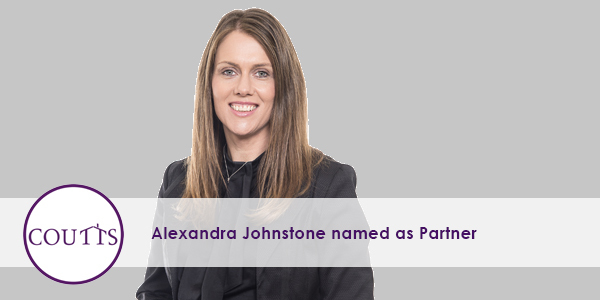 At Coutts, we are pleased to announce that Alexandra Johnstone has been named as a Partner of the firm effective 1 January 2018. Alex brings a wealth of over twenty years experience working in the commercial space having worked as an in house lawyer for various state government agencies, a major university and one of Australia's largest infrastructure service companies. In addition to the roles held as a direct result of her legal skill set, Alex has also held positions such as senior university lecturer and mentor in the commercial law space. Alex joined Coutts in May 2017 as a senior associate and in her time the Coutts team have witnessed the commercial, creative and practical approach Alex takes to providing advice and acting on commercial law and business matters. With Alex's comprehensive experience and as seen in her daily interactions with clients, her true commitment to both the legal profession and to her area of practice shines through. This is further amplified by her commitment to Coutts in seeing to the vision for the firm evolve and exceed expectations. From everyone at Coutts, we congratulate Alex on her appointment. Newer PostWhat can I do if I'm in a partnership or business arrangement but I don't have an agreement? Older PostHow does e-Conveyancing benefit me?